What would make Pep Guardiola and his City players believe they are back on track is they didn’t just get past their opponents but also went through them. 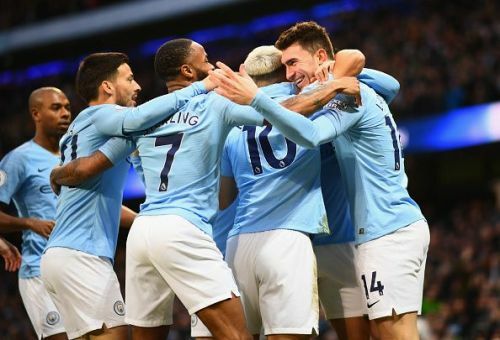 They brought their best football to the table with the subtle flicks, deft touches and all the typical Manchester City moves to pin Arsenal to the wall, as they sought to make up for their four defeats in the past two months. Pep, however, grabbed the headlines even before the start of the game, deploying Fernandinho as a centre-half alongside Otamendi, and having Laporte deputise at left-back. Despite City starting all guns blazing, it was too early to gauge the success of this experiment. In fairness, very few would have imagined it to turn into a masterstroke. The first goal itself was a sign of things to come. Alex Iwobi was dispossessed around the corner of the Arsenal penalty area by Laporte, who dispatched an astute cross towards a stooping Aguero who would once again open the scoring within the first minute. However, they would be in front for just 10 minutes. Torreira swung over a corner from the left and Monreal’s clever flick allowed Koscielny to head home his second goal in three games. City’s response, though, was telling. Not only were they dominating possession, but also pushing forward in numbers, regularly troubling the Arsenal defence. Aymeric Laporte, who was temporarily filling in at left-back, and Sterling’s combination play was a delight to the eyes and equally potent in impact. Either the Englishman would be cutting inside or Laporte on the overlap would be delivering some pinpoint crosses. And, if neither of them, David Silva would be making his little runs in behind the lacklustre Lichtsteiner. Coming back to the revolutionary reshuffle at the back, it was gradually getting vindicated. Fernandinho, in addition to robbing his opponents off possession, would regularly scurry upfield to add more presence in his team’s attack. Each time City got hold of the ball and started to play out from the back, Fernandinho, the usual holding midfielder, could be seen darting forward. At times, he would even rampage down the right flank in pursuit of finding his team-mate with a swish of his right boot. 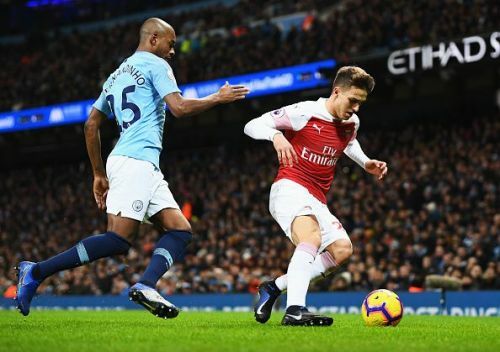 And, just when Arsenal were seeming to claw back into the game, two of City’s biggest forces of the night- the uber-flexible Fernandinho and the link-up play on the left would help them nudge ahead on the cusp of half-time. The Brazilian switched play, playing the ball across to Sterling on the left. The Englishman exchanged passes with Gundogan on the edge of the Arsenal penalty area before skipping onto the German’s precisely measured dink to volley it back across goal for Aguero to accomplish a simple tap-in. The goal seemed to deflate the visitors’ spirit, making it a stroll for City in the second half. The final nail in the coffin seemed to fully acknowledge Pep Guardiola’s tactics. It was almost a carbon copy of their second with Raheem Sterling cutting inside neatly, once again veering beyond Lichtsteiner to deliver an inch-perfect cutback for the man of the match, Sergio Aguero, to slide home and complete his hat-trick. The win, which gets City to just two points off Liverpool at the top, brings into sharp focus a few aspects of Guardiola as a manager. One, his intolerance to faulty play which was evident when he thrashed a water bottle, despite his side leading two goals to one. Second, his extreme belief in his players and thus his freedom to bring about such a revolutionary reshuffle. Last but not the least, he never allows his players to relent. which has been brought to light by the barrage of goals his side has scored over the past few months. As it was, last night’s 3-1 victory showcased Arsenal were completely engulfed by City's brilliance all over the pitch, and definitely took Pep Guardiola’s managerial potency one notch up.